The A-DYN is the newest pickup of Schertler. 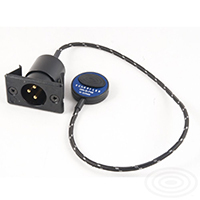 It is a low impedance transducer suitable for all instruments, and can be connected to any mixing board in a microphone input. But the use of the A-PRE preamplifier (sold seperately or as a set) is recommended. The A-PR offer a roll-off filter, a 3-step gain, and phase reverse. The contact microphone is about the size of a coinand installs to the top with adhesive compound. The position above the sound-post is recommended. The DYN-B-P48 is a fully balanced, active, dynamic contact microphone with Class A electronics. 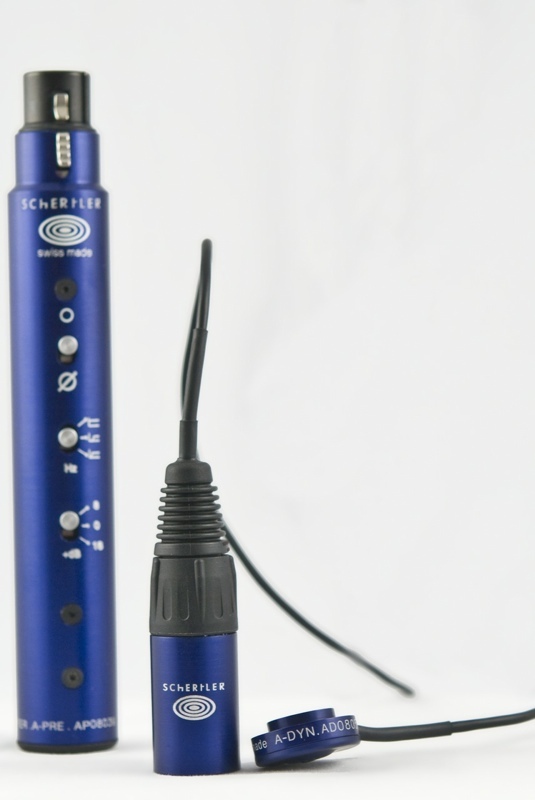 This microphone is offered for different instruments, each model features specifically designed active filtering technology. Schertler’s first double bass pickup existed of two capsules out of wood and cork. This sealed sound chambers are constructed around a miniature eletrostatic microphone, and were stuck into the two holes of the bridge. The succeeding model follows the same principle, but it consists of only one capsule. To attach the capsules, small wood wedges have to be glued to the bridge and the cork sides of the capsules have to be adapted to the curve of the two bridge holes. This entry was posted in Gear Guide, Pickups. Bookmark the permalink. I can tell only about the StatB. I have used the Stat-B with both the Stat Pre and the PreAll preamps for 6 years. It replaced my trusty Underwood and gives me a bit more refined pizz sound and much better (although not natural) arco sound. The response is full range unlike some body pickups I’ve tried which tend to be on the dark side for pizz. Both preamps deliver a similar sound, so if you don’t need the bells and wistles, the Stat Pre will be fine.